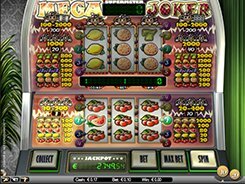 Mega Joker is a 3-reel progressive slot powered by Net Entertainment. The jackpot has an average amount of €15 thousand and is won every 4 weeks. The gameplay takes place on the bottom reels and upper Supermeter reels, both having a 3x3 reel arrangement. 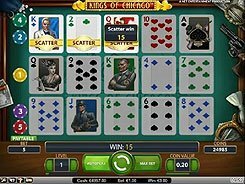 You start playing at the bottom reels, and every win will transfer you to the top reels featuring more lucrative awards. A coin comes in two values of $0.1 and $0.2, and you can choose from betting on a single payline or on all lines, without any in-between options. In Mega Joker, a progressive jackpot is awarded at random, without your having to hit any specific combination of symbols whatever. The only qualification requirement for winning a progressive jackpot is that you need to bet at least 10 coins, that is $1 or $2 per spin. There is a mystery cash prize that can be won if landing three Joker symbols on a payline. 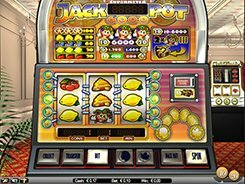 Playing on Supermeter reels (the top set of reels), you will grab a random cash award of between 100 and 2000 coins for that combo. PLAY FOR REAL MONEY!